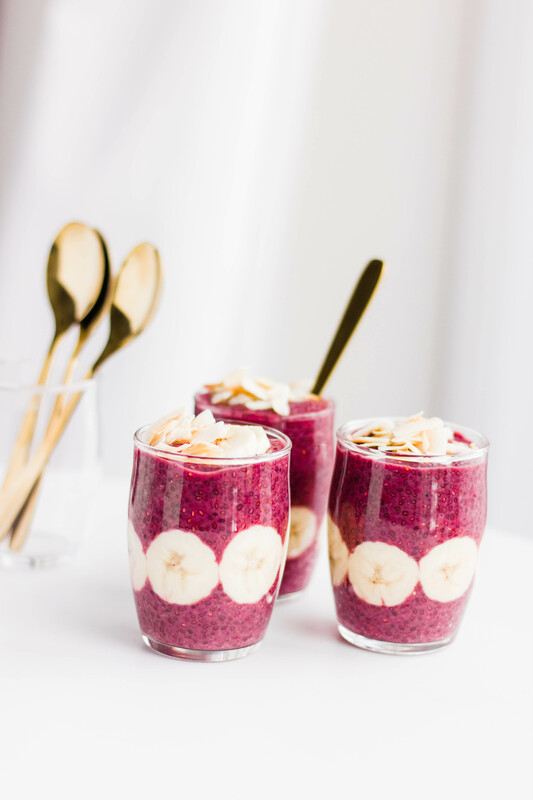 Strawberry-Banana-Beet Chia Seed Pudding— Made with a blend of almond and coconut milk and sweetened with maple syrup, making it a healthy vegan and gluten-free dessert. 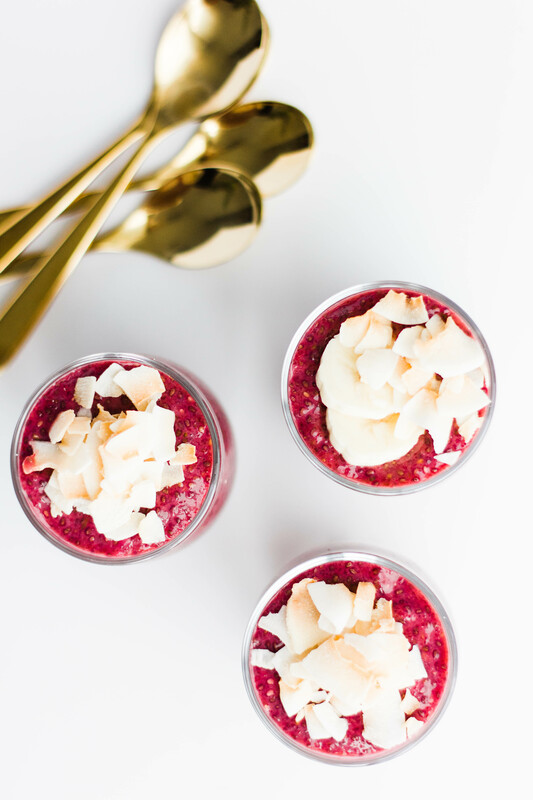 I like to drop mad beets, that is, in my chia seed puddings… ? Okay, I just needed to get that pun out of my system and now we can move on. 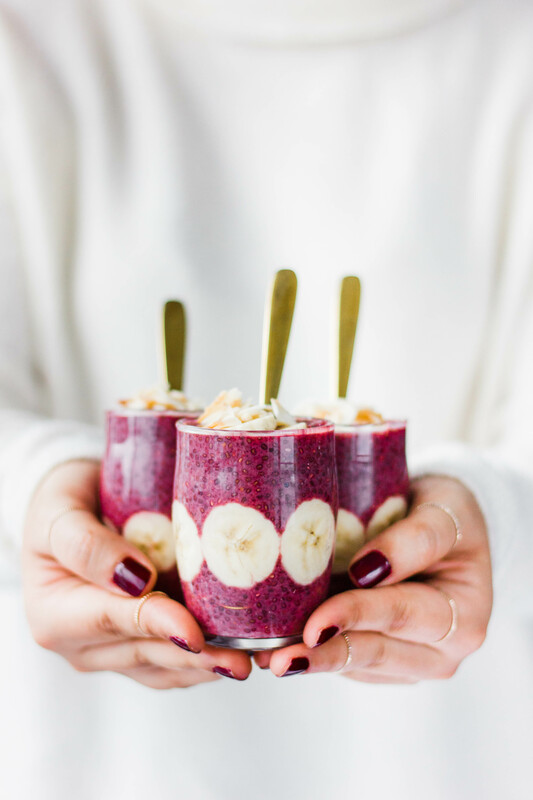 On a serious note, this chia seed pudding is so freakin’ delicious but can we also admire its gorgeous color!? I’m a firm believer in eating not only with your mouth (duh) but also with your eyes. Visual presentation is just as important as flavor, and when you’re eating something as healthy as this, you need a little prettiness to entice you, right? And it’s an added bonus points if your kids are all over it too, they won’t even know there’s veggies hiding in there, unless they help you make it of course. Speaking of visual presentation, all I did was slice some bananas and slightly pressed them on the inside of the glass. 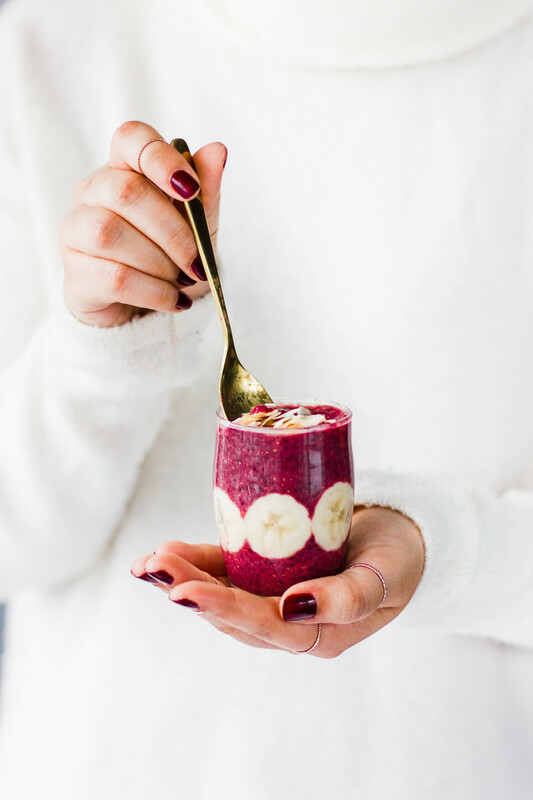 Easiest little trick to get your chia seed pudding to look that much cuter. Again, recipes without breaking a sweat are my absolute specialty! Healthy? Check! Effortless? Check! Versatile? Check! Most importantly, delicious? CHECK! Chia seed pudding is one of my favorite desserts to make. You can spruce it up with basically anything you want. Chocolate? No problem. Want a pineapple version, or key lime pie perhaps? Yes girl, you got it. This healthy snack not only tastes amazingly delicious (wait, did I already mention this before? ), it comes packed, and I mean PACKED with nutrients. 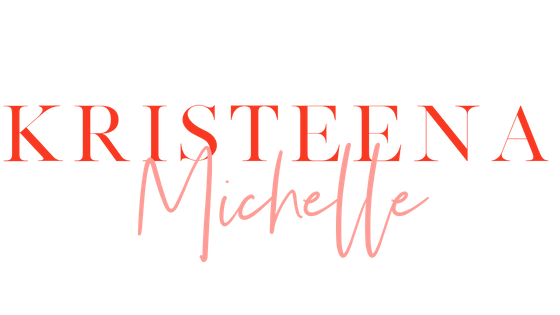 Nutrients that are so good, your body does a little dance, makes a little love, and gets down (tonight). Tell me you sang while reading this and maybe did a little boogie?! Just with a quick google search, you can find all the nutrients and magical unicorn powers that are packed in that little chia seed. I’m no nutritionist or doctor, so I won’t go on with all the info, BUT I’m your trusted homie and say that this is something you need to get down with. Now I’m done taking up all of your time with all this blabber jabber. Let’s move on to the recipe, okay? In a bowl, add chia seeds. 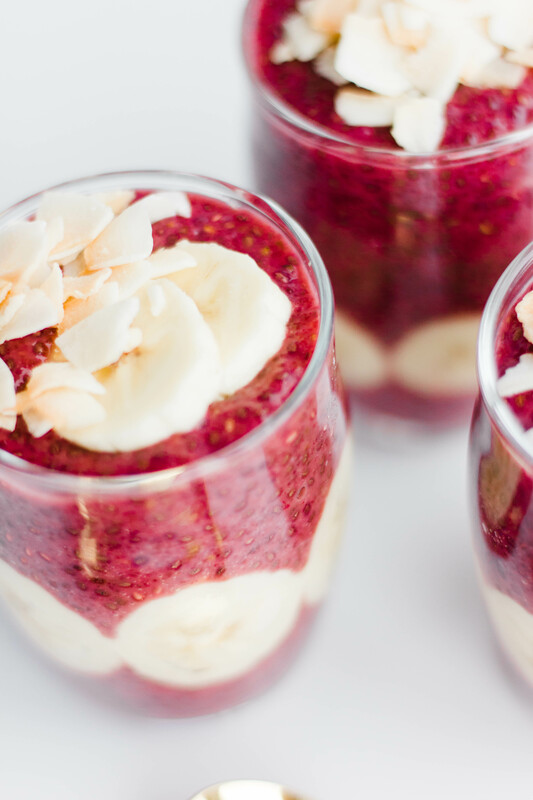 In a blender or food processor, add coconut milk, beets, strawberries, banana, and vanilla extract. Blend until smooth. While stirring, slowly pour the mixture in the bowl with the chia seeds, until thoroughly mixed. Store in fridge overnight or 4-6 hours. When ready to eat, stir in maple syrup in individual servings. Top it with fruit, coconut flakes, granola, or any topping of choice. If you're not a fan of banana, mango would be a delicious swap. *For the coconut milk, I use a blend of almond and coconut milk from Earths Own So Nice. You can add any non-dairy milk of choice. The pudding will keep in the fridge up to 5 days. I like to whip up a batch on Sunday night and I'm set for the week! So, who’s having some chia seed pudding this week? ? Also, tell me what your favorite flavor combo is!